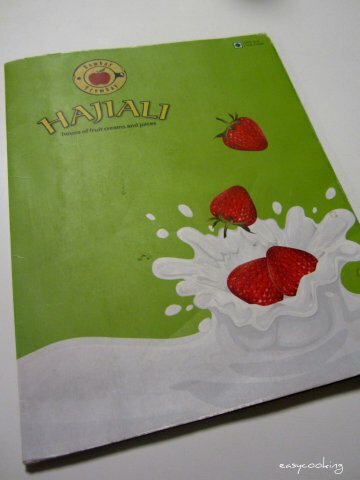 We've been hearing so much about Hajji Ali and their out of this world Fruit Creams and Falooda that we just had to try it.We chose the wrong day though,full to the nose from a delectable sizzler dinner at Tangerine,we have no idea why we went to Hajji Ali,but we had to! We chose the G.N.Chetty outlet,and plonked ourselves at ground floor which was empty,all the crowd(we were told) was on the first floor enjoying the view.We decided to go for falooda,but oh boy we were confused.There were more than 6-7 varieties of falooda! !Between 6 of us,we chose to have Fruit Falooda(a must try)which was truly awesome with fruits like Lychee,Kiwi fruit,Strawberry along with regular fruits like apple and banana with ice cream,khus khus and semiya. Strawberry Falooda was a twist to the regular falooda with sliced Strawberry and strawberry ice-cream.The rose flavored milk was delicious. Kesar Royal Milk shake was one of their signature drinks and it was truly royal.It was too sweet for our palates,but maybe we would have enjoyed it if we weren't that full from our dinner.It had thick saffron milk with kesar ice-cream and pista and almonds. The first thing which strikes you is the portion.Move away thin falooda glasses,here is the real deal.It is quite filling on its own,so maybe someday we'll skip our meals and head straight to Hajji Ali!They also serve short eats like Pizza,Sandwich etc.Prices hover around the 100rs mark but totally worth every penny. Greams Road,Murugesa Naicker Complex, Near IDBI & SBI Bank, Anna Salai, Thousand Lights. Thanks for the wonderful review.Cannot wait to try out their dry fruit falooda and mango cream! I'm coming to Chennai this year. So many places to eat..so little time already. My hub loves falooda..has his fav places in bombay to eat this - let's see if I can get a bite in chn. Nice! Hey Divya! Stumbled on your blog a few months ago and ever since been a huge fan. Visit it often, especially to get inspiration. You’re doing a wonderful job! Clap! Clap! Presentation is perfect accompanied by slick, delicious pix. As for the recipes you post … awesome would only be a mild word  . Only a small hitch … wonder if you could do something about the wall paper like background that loads when you open into the blog? It kinda takes very long … wonder if other ppl are facing the same prob? Hey Aruna,Thanks for the encouraging words.I am not sure if other people are facing any problems while opening the blog.Usually a quick refresh loads the page faster.If the problem persists,I shall definitely do something about it.Thanks for letting me know!